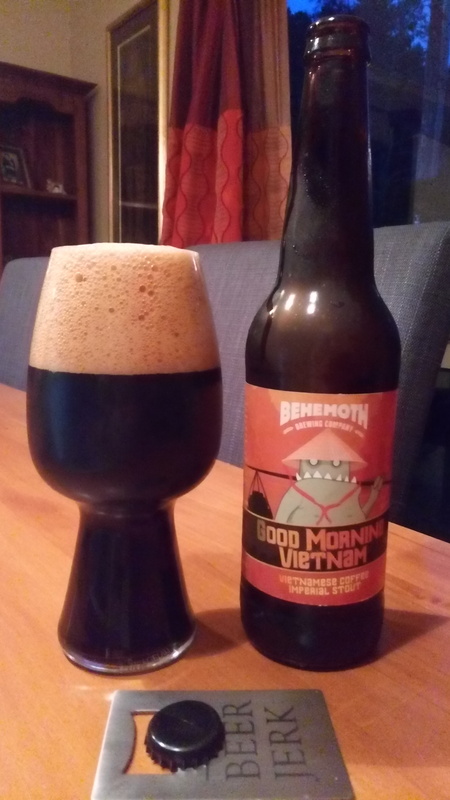 Behemoth – Good Morning Vietnam. A beer inspired by a holiday, or at least the coffee on Holiday. Imperial Stout with Vietnamese Coffee. Like drinking a Vietnamese coffee in Imperial Stout form. Vô! So, Những gì có thể sai? Much duller coffee note on opening, I like that coffee note, the roasted burnt thing that can bring great joy. 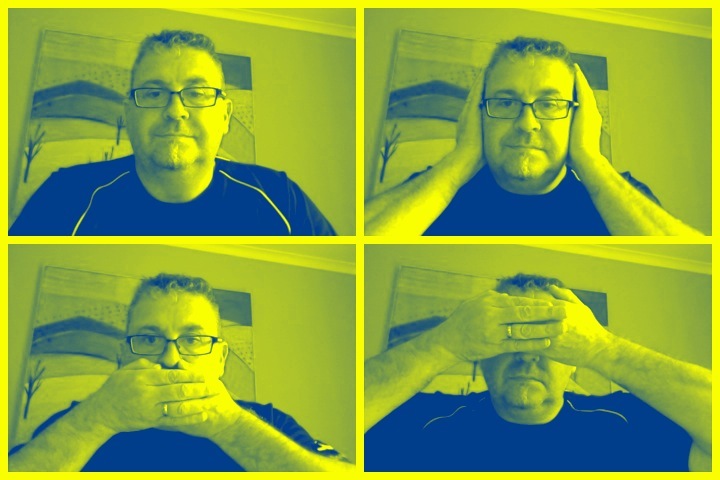 I supped, I stopped. That’s properly full on brilliance. Outstanding! There’s something about having a truly good beer that makes you smile and take note. This is a really polished beer that delivers what it ways, It’s a full body imperial stout that looks great smells brilliant and then tastes like smooth as silk coffee over a mighty bitter stout beer with a lovely lingering taste and a meer hint of dryness. It’s properly good, I think I may have said that already. Seriously though the coffee is intense, sweet, coffee plus. why isn’t all coffee like this? Why wouldn’t you fall in love with this coffee. Why hasn’t this been done before. The most startling thing though is the warming sensation that you get as you drink this beer, it’s a wonderful and strange thing. The other thing is that you start quaffing this because it is totally the best beer I’ve ever drunk today, and I wish I’d had it yesterday, sometimes you have to kiss a lot of frogs to get to the prize. I need to calm down and sip like a proper person, but this calls you and beckons you in, for me this is properly good brewing at the top level. This has to be easily in contention for the best beer this year, particularly as it is in a ‘common’ style but seems to be head and shoulders above where the others are at. The pdubyah-o-meter rates this as 10 of its things from the thing. It’s hard to fault, and if it had a fault it might be that the pour was a bit excitable, or I was keen, The aroma is there though, and the taste grabs you from sip one. That is a king amongst beer. Where did I get it? Liquorland of course. Am I enjoying it? Yes, I almost did that in caps I was that excited. Would I have another? Yes this is brilliance. Would I share with a friend on a porch and set the world to rights? I’d have a party based around this, it’s really really nice, the aroma, looks and then the taste are outstanding, it starts well , delivers some more then unfold s into something better. It’s properly and undeniably good beer by any measure of how you make it. 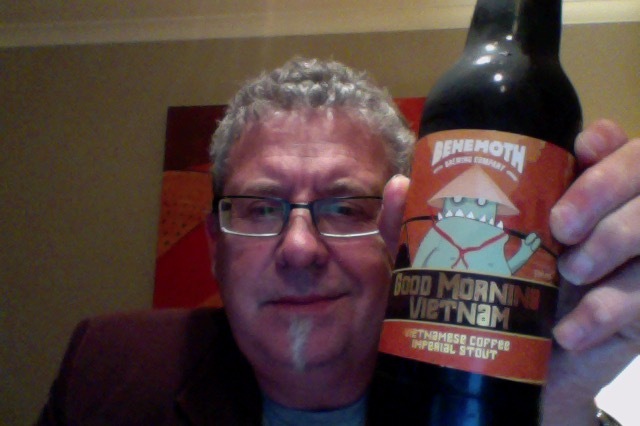 This entry was posted on September 8, 2017 by Philip Walter in Beer, Beer of New Zealand, Beer Review, Behemoth, Brewed By, Craft Beer, Critic, Imperial Stout and tagged Behemoth Brewing, Behemoth Good Morning Vietnam, craft beer, Good Morning Vietnam.